in the Internet of Things (IoT) is based on the Internet TCP (Transmission Control Protocol) and UDP (User Datagram Protocol) along with linked internet protocols for setup. For the IoT to grow into its projected future, the need for a standard communication protocol is crucial. To choose the correct communication protocol, the outcome of the data transmission must be carefully analyzed. If a business chooses a less than optimal communication protocol, it may be difficult to go back and modify the process. The IoT allows devices to be connected via the internet with the intention of improving business tasks, insights, and scalability, all of which typically add value to a business. The IoT is intrinsically linked to innovation. On the one hand, new products, novel business models, improved processes, and innovative interactions are bound to emerge. On the other hand, groundbreaking technological advances will be necessary before the IoT begins to realize its full potential. Companies engaged in any type of IoT related innovation may qualify for significant federal R&D tax credits. If a standard communication protocol is developed, the IoT can begin optimizing on its potential. According to 451 Research, mergers and acquisitions related to IoT continue to surpass records. In fact, in 2015, buyers spent $14.8 billion in purchasing 39 IoT-related companies. As the IoT develops, future predictions as to where connected products are headed come to light. According to Cisco's Visual Networking Index, many things will evolve in the IoT world in the coming years. 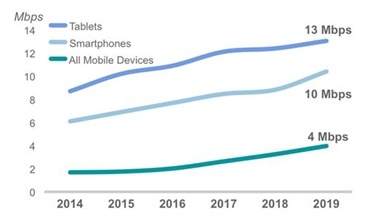 By 2019, there will be approximately 1.5 devices per capita. This means there will be 11.5 billion mobile-connected devices, including machine-to-machine (M2M), which will exceed the world's population. Also projected to increase is internet speed. In 2014, the average internet speed was 1.7 Megabytes per second (Mbps). This number is expected to reach 4.0 Mbps in 2019, as shown in Figure 1. The increase in speed and amount of connected devices demonstrates that the projected increase in the IoT will be major. In a press release, Stamford, Connecticut-based Gartner, Inc. provided their take on where the IoT is headed. Their belief is that cars will be a major opportunity for growth within the IoT, and that we should expect a quarter billion connected vehicles on the road with in-vehicle advanced features and automated driving capabilities by 2020. Additionally, the IoT enables businesses to achieve material cost reduction. For example, in the same press release, the company predicted that “the connected kitchen will contribute at least 15% savings in the food and beverage industry, while leveraging big data analytics." The direction of the IoT ensures that consumers and businesses will enjoy numerous benefits with newly connected devices. Business processes are expected to improve and become less costly, while the consumer will enjoy the ease of several daily processes and costs within their home. To begin the process of building an IoT application, the proper platform must be chosen. In simple terms, a platform provides the ability for a user to build an application for IoT with components that are already configured for the user. There are various tiers involved in a platform that would normally be time consuming to create from scratch. The foundation for IoT applications is the "things" themselves; this is where the protocol is properly identified and chosen. 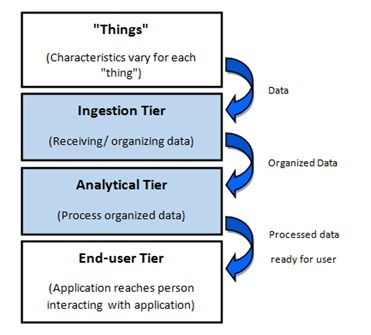 The next tier is the ingestion tier, which simply involves receiving and organizing streams of data from the "things" so that the next tier, the analytical tier, can process the data. Lastly, the end user tier is where the application reaches the person who interacts with and sees the application. However, it makes more sense to build an application on top of a readymade IoT platform. These platforms will normally incorporate the ingestion and analytical tiers because the user will have their own "things" to input in addition to interacting with the end user tier. A preexisting IoT platform will also provide management capabilities, a real-time message bus, and an API that allows communication between the platform and applications built on it. Within the IoT, platforms exist that permit users to build applications. For example, Zatar, located in Chicago, IL, is a cloud-based platform that identifies when a M2M connection occurs. This platform permits devices to connect to the same source where data can be exchanged continuously. The solution is aimed at helping businesses reinvent themselves by employing a M2M communication platform. Satellite: provides communication between a cell phone to the next antenna 10 to 15 miles away. The IoT calls this M2M communication as it is receiving and collecting data. In the IoT, companies and users can have total quality monitoring and control over inventories, equipment, possessions, and household products. An object with a device would capture an event and pass it through a network to an application for processing. Wi-Fi: wireless local area network (WLAN) that provides internet access to devices in range, which is approximately 66 feet from the access point. Radio Frequency: this is the easiest form of communication between devices. Protocols such as ZigBee or ZWave use a RF low-power radio embedded in devices and systems that range approximately 100 feet. RFID: the wireless use of electromagnetic fields to identify objects. This does not require power, but can be costly. RFID incorporates the wireless exchange of data between a tagged object and a reader/writer. For example, identification tags can be found in laptops, tablets, toll passes, military aircrafts, passports, credit cards, and more devices. Bluetooth: wireless exchanging of data in short distances by using short wavelengths. Near Field Communication: uses electromagnetic inductions between two loop antennas near the fields of one another. NFC has low speed connection and is used for short ranges. These standard protocols have their own characteristics which enable unique communication and it is worth noting that there are more variations beyond these six standards. Regardless, of these, it is important to select the most suitable one that will meet the specific needs of the user. Different communication protocols serve purposes that meet the needs of a consumer trying to transport data. For example, MQTT collects data and communicates it to servers (D2S). XMPP is another protocol that connects devices to people (D2S). DDS is considered a "fast bus" for integrating intelligent machines (D2D). Lastly, AMQP is intended to connect servers to each other (M2M). When determining which protocol to use, the nature of the operation, management, security, and end-use must be considered along with the environment the application will function in. Most protocols used in IoT are usually geared towards a specific business model. In this case, there are many variations of protocols to be considered in order to meet individual business needs. 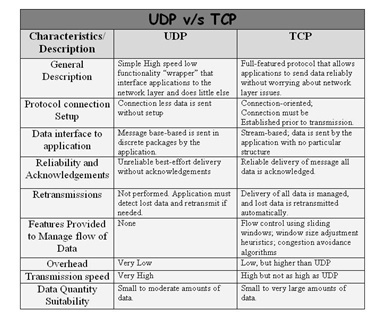 The two main communication protocols are TCP and UDP, each described in Figure 2. These protocols cater to certain forms of communication that stress security and implementation as key features in application development. Amazon, for example, uses various protocols to implement its business model to various to reach out to consumers in varying market segments. Privacy is an important implementation step when assembling protocol components because personal information and devices become available to others connected to the same cloud. To avoid this challenge, developers must manage all data separately within the protocol. Quirky, Inc. of New York City, an invention start-up, is the recent topic of conversation in the IoT world. As of September 2015, the company filed for bankruptcy after raising over $175 million in capital, largely the result of spending all of its capital before creating a viable business. Throughout its six year journey, Quirky managed to develop an IoT smart home platform with innovative apps built on an application called Wink. Quirky collaborated with General Electric in 2013, in which Wink played a critical role in their joint invention. Wink enabled monitoring and control of the Aros window air-conditioner from a smart phone. Quirky's bankruptcy filing removed their assets as well as Wink from the market. General Electric offered $15 million for the assets. Strategic planning is crucial for companies introducing IoT products to the market, and Quirky failed in pursuing inventions that were useful to the consumer. For example, the invention of the "egg minder" alerted smart phones when eggs would go bad. The IoT has the potential to connect many things with one another through the internet. As demonstrated by the example above, the IoT requires great thought and market testing before going through with a product. As a major search engine with the financial capability, it is expected that Google will play a major role with innovative ideas in the IoT world. The four IoT verticals that Google has focused its investments on include: wearables, the connected home, connected cars, and robotics. Google definitely has an economic advantage and can simultaneously move forward with all sectors, including added investments and acquisitions. In 2014, Google purchased Nest, which offers smart devices for the home for $3.2 billion. Nest products that sparked interest in the IoT include the Nest Learning Thermostat and Protect Smoke Detector. Pursuant to Google's 2015 reorganization, Nest will operate independently, but Google sees it as a big part of future ventures in the smart home sector of the IoT. "Your wearable device would know that you have had a very stressful day and that you are heading home. Your connected house knows that you’re on your way home and can turn down the lights and play calming music to adjust the environment automatically based on your mood, before you even walk in the door." Innovative ideas derived from a large company like Google will grasp the attention of many consumers. The platform Android Wear is built on Google, allowing third party developers to expand their wearable applications within the platform. Allowing others to build on this platform increases business opportunities and advances innovation in the wearable IoT market. "As exciting as it is to think about these new experiences and interactions, we also have to be really honest about how they can add value to our day to day lives. Whoever figures out that problem first and creates the “killer app” that will truly add value to our lives, will be the real winner." The IoT has great potential to grow into a smart, advanced communication ecosystem. As of now, many communication protocols exist for different devices to utilize. The ultimate goal is seamless communication among all devices. To achieve seamless communication there must be a standard of communication by which all devices connect and efficiently transmit data to each other. In the coming years, many researchers will strive to discover and implement a universal standard of communication for all devices. Such innovative efforts regarding the Internet of Things are now eligible for research and development tax credits.